On today’s Broken Brain Podcast, our host, Dhru, talks to Dr. Ann Shippy, a physician, scientist, engineer, and mom. She is also the author of Shippy Paleo Essentials and the Mold Toxicity Workbook. 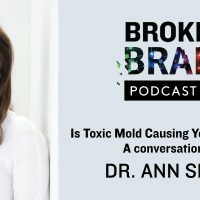 In this podcast, we talk about all things mold including the unrecognized consequences of mold toxicity, the many illnesses triggered by mold, and how it isn’t always obvious when mold is present. We discuss what to do if you have toxic mold exposure, lab testing for mold toxicity, testing for your home, and how to eliminate symptoms and restore your health. I know you’ll love this episode of The Broken Brain Podcast as much as I did. PS – Check out my interview here with Jason Wachob of mindbodygreen where I talk about my own health crisis with mold toxicity. For more on Dr. Ann Shippy, be sure to follow her on Instagram @AnnShippyMD, Facebook at @AnnShippyMD and Twitter @AnnShippyMD. Check out her website https://annshippymd.com. Download Dr. Shippy’s Could it Be Mold Fact Sheet and Resources here. You can also find her books Shippy Paleo Essentials and Mold Toxicity Workbook, right here. Lastly, here are Dr. Shippy’s air filter recommendations: https://www.iqair.com and https://www.airdoctorpro.com.